Mille Lacs Health System is a community-owned, non-profit organization, whose operations are overseen by a nine-member Board of Directors comprised of members from the Mille Lacs community. •	We hold a reverence for life. •	We strive to insure access for all. •	We strive to serve all with compassion and hospitality. •	We believe in open, honest and direct communication at all levels. •	We believe collegiality, teamwork, and participation are necessary for excellence. In the early 1950’s, the lack of available healthcare in the region had become a growing concern for the people of the Mille Lacs area. As a result, residents were growing increasingly interested in building a hospital in Onamia. The Crosier Fathers and Brothers (a religious order of the Catholic church) were instrumental in deepening this conviction and encouraging action. With the financial support of area residents, work on a new twenty-eight-bed hospital began in 1954. Management and administration of the hospital was entrusted to the Franciscan sisters of Little Falls, Minnesota. 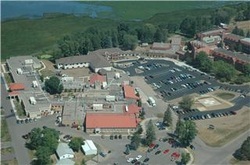 The hospital was completed in 1956 and was staffed by Franciscans and Mille Lacs area employees. The first patients were admitted on April 1, 1956. As the region has grown, so has the hospital. In 1982, a large-scale renovation and expansion of was completed. In 2003 another major expansion and renovation of the hospital’s surgery, radiology, labor and delivery and administrative areas was completed. In order to serve the region’s aging population, construction of a forty-bed nursing home was started in the fall of 1961. The first residents were admitted in the fall of 1962. A major addition in 1979 doubled the size of the existing home and provided a spacious activities room with a panoramic view of Lake Onamia. The first residents moved into the new addition in April of 1980. In 2001, another renovation was undertaken and a beautiful Memory Care Unit was added for residents with special needs. Expansion and renovation of the remaining areas of the nursing home begin in the spring of 2003. The first Mille Lacs area clinic opened in 1977 with the help of a grant from the Robert Woods Johnson foundation. The clinic, then known as Mille Lacs Family Health Center, was a community-owned, not-for-profit corporation, officially directed by a board composed of community members from the Mille Lacs area. Initially the clinic was staffed with National Health Service Corps doctors who offered excellent care but often left at the end of their two-year commitment. Since 1980 however, physicians have remained on a long-term basis and have built stable practices. In 1990, the hospital, nursing home, and clinic were merged, and Mille Lacs Health System was created. In the early 1990’s, as a result of community efforts and financial support, additional clinics were built in Isle, Onamia, and Hillman. The new Mille Lacs Clinic of Isle opened its doors to the community of Isle, June 6, 1994. Mille Lacs Health System remains a not-for-profit, community-owned organization. A nine-member Board of Directors comprised of members from the Mille Lacs community serves to direct and oversee the entire organization. Despite rapid technological change and the economic stresses of today’s healthcare environment, Mille Lacs Health System remains strong. Numerous medical and surgical specialists have joined our healthcare team, providing diagnostic and support services that allow for a sophisticated level of diagnoses and treatment in a local setting. Our mission and values also compel us to take a holistic approach to our patients’ healthcare needs; addressing their emotional, mental, and spiritual concerns as well as their physical needs. In addition to traditional services, we now provide access to a variety of counseling services as well as health education, wellness and rehabilitation programs. part of a community-driven, community supported healthcare system. We look to the future with confidence.